Spring is about to be sprung upon the Northern Hemi! To celebrate, Wild Things is returning to the one plant per month theme. 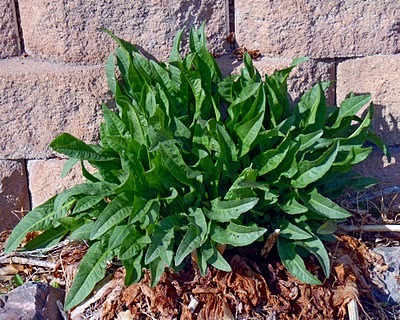 The featured plant for Wild Things in March is humble, but one of my favorites - dock (Rumex spp.)! I've gotta be honest. Spring looks to be a long shot around here. The ground is still various shades of brown and snow, and we face the possibility of snow clear through May. However, if the weather plays out just right, with only periods of snow and sun, with no nasty cold snaps, a few precious spring greens may emerge, and I'll be able to play along with y'all. One of the first plants to take hold here is dock, and it is usually the first that I can bring home in a quantity large enough to add to my meal. That day can't come soon enough. I'm itching to get outside and stretch my legs, to smell green things on the air, to eat fresh food. Chances are, if you leave near disturbed ground (those places that humans have messed and left), you can find some dock. The various docks, of the Rumex genus, are widely distributed. Look for the long, narrow leaves of dock (the one exception is bitter dock, which tends to have heart-shaped leaves), which usually have a smooth surface. The leaf margins of dock can either be smooth or wavy, depending upon the species. Size of the plant can vary widely, from the petite leaves of willow dock, to the enormous leaves of patience dock. In the spring, new leaves emerge from a papery sheath at the base of the petiole, and are usually covered in a mucilaginous slime. As the leaves grow, they progress from rolled up cigars to long green leaves. If you are uncertain about identification, it is helpful to look for the previous year’s rust-colored stalks. When the weather starts to heat up, dock sends up rapidly growing stalk, covered in greenish-brown flowers. These stalks, and dock’s fruit, which are commonly referred to as seeds, quickly mature to a characteristic burgundy color which can be easily spotted, even at a distance. Dock leaves are best when harvested in the early spring, and autumn, before and after the heat and flower stalks make them bitter, and the bugs munch them to bits. Dock has a reputation for being bitter, but so long as you keep a few tips in mind when harvesting, you’ll know how to pick the most delicious leaves. 1. Younger leaves are best. Leaves which are still rolled, or ones that have recently unfurled, evidenced by telltale wrinkles running lengthwise down the leaves are your best bet. 2. Check for tenderness. I prefer to harvest dock by sending my thumbnail through the stem. Done in this manner, it is fairly easy to tell whether or not a leaf is tender. If you meet a lot of resistance with your nail, the leaf will be tough. 3. Look for red/purple/burgundy spots on the leaf. These may indicate bitterness. 4. Do a field taste test. Dock should have a slight lemony tang, like sorrel. But if the plant you taste is bitter in the field, it will also be bitter in the pot. Once you've brought a mess of dock home, the first order of business is to give the leaves a thorough wash to clean them of slime, paper sheathes, dirt, and bug eggs. Do this like you would salad leaves, by swishing them around in a large quantity of water, then gently lifting them from the top of the water, letting all dirt remain in the bottom of the wash.
Once you have clean leaves, you are ready to cook with dock. This is a leaf which is best cooked because, like spinach, it has a high oxalic acid content. Use the delicious lemony sorrel-like leaves of dock in any number of dishes, from stewed greens, to sauces, to egg dishes. 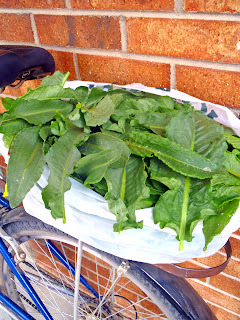 It can also be fun to stuff dock leaves, if they are large enough to do so. The leaves aren’t the only edible part of dock. The petioles (leaf stalks) of dock can also be pleasant to eat, so long as they are still tender. Slice them to at least ½” and add to any dish in which you are using the leaves. 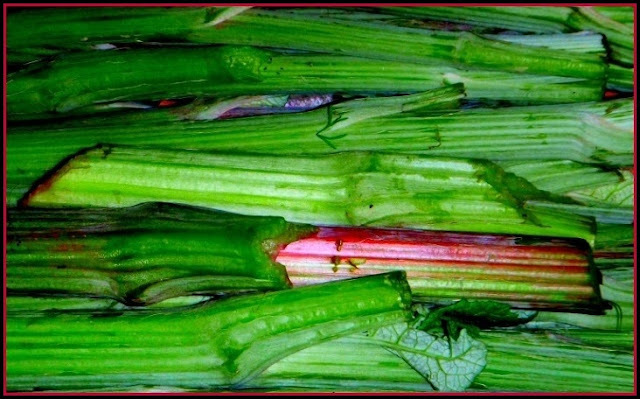 Or take advantage of dock’s being a kissing cousin to rhubarb, and combine the sliced petioles with other fruit in dessert crumbles and sauces. Dock also pairs well with meat, and can stand up to strong spices. Dock seeds may also be used in cooking. 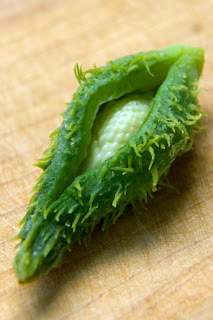 After harvesting the seeds, use your hands to rub off some of the papery husks, then winnow them away. Some prefer to grind the seeds straight away. But others find them to be too bitter without first leaching in water for a few hours, and re-drying. Either way, once you have ground your dock seeds into flour, it may be substituted for between ⅓ - 1/2 of the regular flour in baked goods. Dock seed flour is delicious in buckwheat griddle cakes, and also makes a nice addition to crackers and breads. Looking for more resources on foraging dock? Check out these posts by Wild Food Girl, and Merriwether's Guide to Edible Wild Plants of Texas and the Southwest. ****I'd like to add a special invitation to my herbalist friends to submit "recipes" for using dock root as medicine. It's your turn! Wild Things is a foraging recipe challenge (read more about the rules and such here). Go find some dock, cook up something great, and send your recipe to wildthings.roundup@gmail.com before the end of the month (sooner is better for your kind host). I can't wait to see what y'all are cooking up with this tasty plant. Have fun! Oh yes please... birds were singing their hearts out this morning, I hope that's a good sign! I'm gonna be like a bird with a worm, searching for those first dock leaves to spring up!!! Here in Italy, spring is in the air and I know where there is a bunch of dock growing. I've never tried cooking dock before (not many people eat it here,although they do eat lots of other wild leafy plants). I'm going to try some now after reading your post,probably with chillipepper, garlic and olive oil. Thanks for stopping by, Diva. I wonder why it is that more people don't take advantage of dock? It is so ridiculously plentiful, and really tasty. Part of me says, "more for me!," but a larger part just feels it's a shame. I was wondering if I can feed the dock seeds to my chickens? Does anyone know? I posed this question on the blog's facebook fan page last week. I hope some of the answers will be helpful to you. I am so excited to have found your page! I am new to wild harvested foods as of last spring but I think once a person discvoers they have a love for foraging it just grows from there! I can't wait to read all your upcoming entries! We live on an olds farm and the previous generations curly dock. However they have all passed on. I'm asking if the roots are also edible and if there is anyone out there with a recipe. Is the curly dock root edible? Thank you.